Buy from our fish service counter where your fish will be cleaned and filleted for you. Place the mackerel fillets, skin-side down, on a large baking sheet. Grate the zest from the lemon over the fish and sprinkle with the thyme leaves. Drizzle with the olive oil and season generously. Set aside to marinate for 5 minutes. Heat the butter in a large pan and, once melted, stir in the couscous and 400ml boiling water. Cover and leave to stand for 5 minutes. Preheat the grill to medium-high. Squeeze the juice from half the lemon over the mackerel and cook for 4-5 minutes, without turning, until cooked through. Stir the watercress or rocket into the couscous with a fork to wilt the leaves and fluff up the grains. 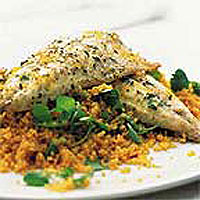 Divide between 4 plates, then top each pile of couscous with 2 mackerel fillets. Spoon the pan juices over the fish and serve. Use whole sardines as an alternative to mackerel. Allow three 75g sardines per person and cook for 3-4 minutes on each side.